Karunanand Hydropneumatic Controls (p) Ltd. The Parking Guidance system helps users locate parking spaces effectively using a system of guided information. - Car rental management website provides reliable for Reservations which can be made by Agents, Passengers using Google Map base addresses and predefined addresses. In a metropolitan cities , most of the car parks are manually managed and inefficient.The owners of the car do not know the current status of their desired parking lots. We provide complete solution for PARKING FEE MANAGEMENT SYSTEM used in Shopping Mall / Residential Complex Parking System. It is unmanned at ENTRY and charges at the EXIT. It uses latest RFID Technology with picture taking system integrated with Boom Barrier. 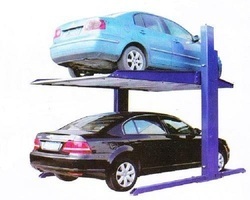 We provide time tested Multilevel Car Parking systems both Automatic and Manual types. We can manufacture according to clients specifications by utilising less space. We use high quality materials and manufacturing standards, so clients are very satisfied with our products. We have designed and manufactured big structures to the tune of 2000 tonnes. Bengaluru based architect Indraneel Dutta, principal architect of DKA - an award winning practice in India believes that we do not yet have an evolved public parking system or MLCP (Multi-Level Car Parking System). He feels that the Government should encourage and float public private partnerships to open parking lots. 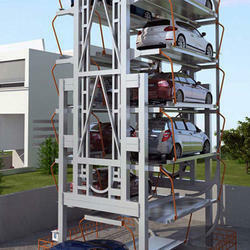 Stacked Type Car Parking System Stacked Car Parking System is similar to the two post car parking system (Hydraulic type car parking system). Hydraulic System with use Rope / Chain to levitate the Car. Cut costs and increase revenues with accurate, comprehensive, real-time data. Bluecode Smart Park software collates and analyses live information on how your parking space is being used.